Posting a series of new Glacier National Park photographs from 2013. This is a photograph of a storm on Saint Mary Lake from 2013, one of my favorite places and one I have photographed literally hundreds of times. 2001 was the fist time I photographed the lake. At that time I saw huge waves crashing on the shore of Saint Mary Lake, so I decided to figure out how best to photograph it. . . It is challenging. I'll give you a warring, and some advise, you're going to get wet if that bothers you, stay off the shore when the wind is blowing. If you don't have gear that you can get wet, forget shooting this lake-shore when the wind is blowing - your stuff is going to get wet!!! That's just a fact. 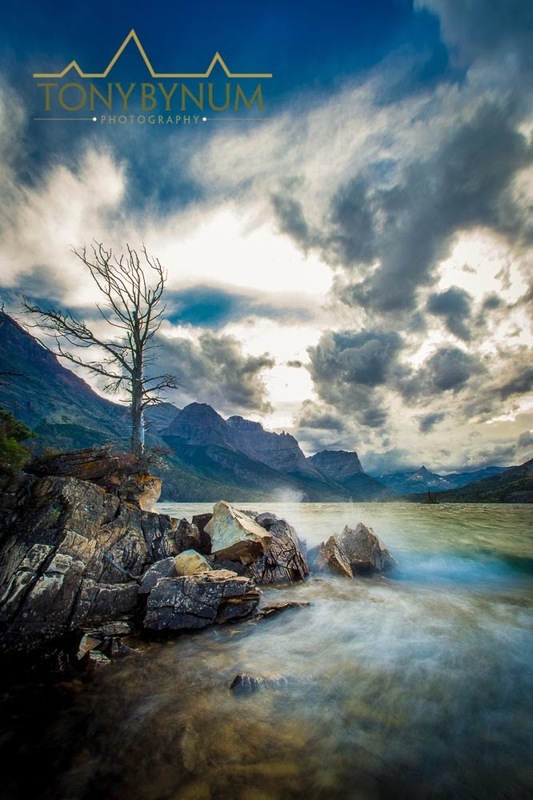 Waves crashing down on the shore of Saint Mary Lake, Glacier National Park, Montana. A stunning perspective from Glacier National Park. Nikon d4, Nikon 14-24 f2.8 lens, Really Right Stuff legs, and ball head, several filters . . . ©tonybynum.com all rights reserved. For 2013, Glacier National Park was average to above average to outstanding depending one when and where you were. In some places the summer weather helped produce some of one of the best alpine wild flowers I have ever seen. The lower to mid elevations in several drainage's, were fantastic as well. Fall conditions, well, lets not talk about the fall colors on the east side this year - basically I can say this, "what fall colors." As is par for Glacier, the leaves along the east side (Saint Mary, Babb) turned brown and never produced the fabulous colors some of you may have seen in the past or in photographs. The fact is, it's about every 5 years that we get a fall to remember on the east side of the park. The west-side was another story, it was great. Lots of nice color and a long warm fall weather. One of the great things about photographing Glacier Park, and being a Montana outdoor photographer is the extreme variability. There's always some place new or un-explored or in the very least, different, to photograph. Living and operating an outdoor photography business in Montana, on the edge of Glacier National Park, is any outdoor photographers dream. I've been here for over a decade now and love it everyday! A benefit of living here is that I see Glacier National Park every day - well, when I'm home or in the office. Seeing the same place over and over again has taught me to have more patience. Light is the key to photography Glacier National Park. Anyone can take photos of the park, but if you want to create something new and or unique, it's all about the light. On the bright side, if you stick around long enough, you'll get dramatic light! Perhaps something else that tempers my view and allows me to become a better Montana and Glacier National Park photographer, is that I see it so often I'm not "star-stuck" by a beautiful scene. It's my assertion that most photographers arriving in Glacier National Park are spellbound the moment they see it. Being spellbound or starstruck almost forces you to start taking photographs just because your're there, and just because you think the scene is stunning . . . I'm not saying it's not, I'm saying our minds might be calibrated a little differently. Just as a New-York'er will say that tall buildings are stunning, when I step out of the train station in downtown Manhattan, the top of my head snaps back and my eyes are on the tops of towers and man made canyons . . . I'm star struck and might even snap a few spontaneous photos. Will they be as good as someone that knows the city intimately, maybe, but most likely they wont. . . I must admit, sometimes fresh eyes are often more of an asset than time and experience - maybe we begin to take some things for granted if we see it everyday. The bottom line is, be in the moment no matter what you're photographing. Being in the moment, and letting go of all that's in your world, at least for a morning will improve your photography more than two hours of reading Outdoor Photography Magazine (no offence OP) or studying the latest gadgets and buying a new camera. Connecting at the root level of your being will help calm you down and set your perspective in the direction of balance and solitude which will allow you to relax, enjoy yourself, and capture unique photos. Well said Tony! And so true. During my first (and so far only visit to Glacier, but there will be more!) I stopped the car more times than I can remember on Sun road. I was overwhelmed by the vistas at every turn of the road. Envy your access to such an amazing place. Thanks for sharing photos and insights.